Kaye’s class had their holiday celebration last Friday and I was in charge of games. I made this game within minutes and the first graders loved it. They thought it was hilarious. We played this at home with the younger girls too. They loved it. See how to play and how to make it after the jump. 1. I cut a large 12×12-inch circle out of the white poster board. That’s the snowman’s head. 2. Then I cut the snowman’s facial features out of the rest of the card stock paper. Orange for his carrot nose. Brown for his coal eyes. Pink or red for his smily mouth. And black for a top hat. The top hat required glueing. I cut a strip of paper 12×2 inches for the hat bottom. Then a rectangle about 8×6 for the hat top. Glued the two together to create a hat. 3. Then I covered both sides with contact paper. Easier if you just laminate it, but I didn’t have time to do so and used contact paper instead. This allows the pieces to be reusable. 4. Place sticky tacks or lots of tape on the back sides of the facial features. 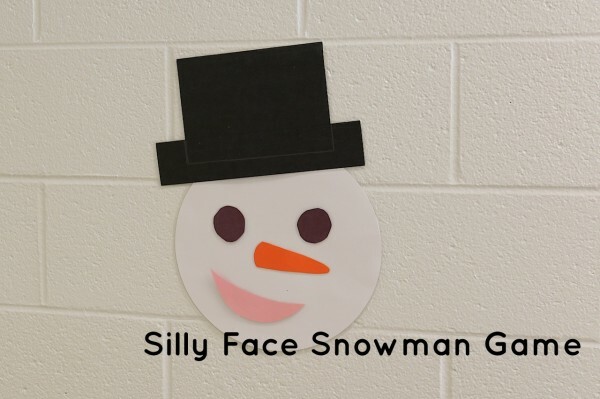 And place the snowman’s head on the wall at the children’s level. 5. 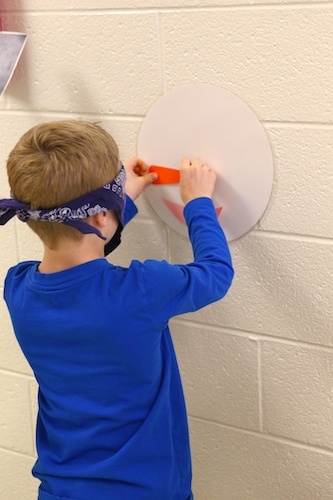 To play, blindfold the child. Place them in front of the snowman’s head on the wall. Hand them one piece of the facial feature at a time for them to place on the head. Then let them see their artwork. Picasso would love it. » Tell me… Do your children have holiday parties at school? What do they do at the parties?